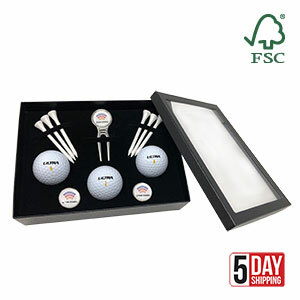 Card window box containing one Kensington fork, two Forbes stud markers and three Wilson Ultra golf balls all printed to your design with six plain white 70mm tees. Dimensions : 195mm x 145mm x 45mm. Leadtime: Ships on 5 working days from an am pdf proof approval.